As many of you know, due to my heart condition, I was recommended to be on the Mediterranean diet. Unlike most diets, this one is fairly easy to adhere to and doesn’t you require to completely change up what is in your cupboards. It is well-balanced and ever since being on it, I have felt so much better, in the sense of having more energy. The more I learn, the more I realize it is all about balance. And that’s just life, right? 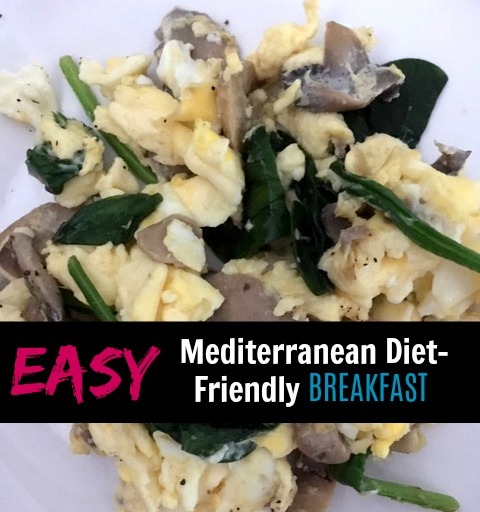 I share about many aspects of my life, and since I continue to have a few questions about this diet, I thought I’d try to share some recipes that I’ve really enjoyed. This breakfast recipe is nothing profound. It is something you probably make on the daily, but for me, who was a cereal girl every morning, this has been a filling and satisfying alternative. I still eat my cereal, but not 2-3 times a day anymore. I truly was surprised though, how full I felt after eating this breakfast, like I said. Give it a try! Mix two whole eggs with a little milk. Cook until eggs are fully cooked. The simplest of recipes, but one I continue to eat day after day, that has yet to disappoint!